It's important to choose the right paper for the job. Go for thermal printer paper if you are looking for clear, sharp receipts when you print. 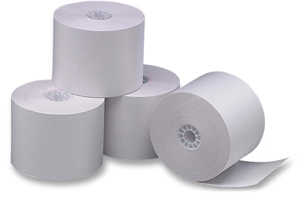 Our thermal printer paper and cash register paper roll options are compatible with almost all types of printers and cash registers. This allows you to stock your supply cabinet and forget about supply shopping for a while. If you prefer brand-specific rolls, we recommend refining your search with respect to the brand you are seeking. 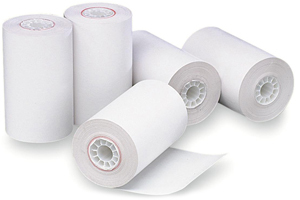 Thermal printer paper rolls come with a smooth design that allows free flow through the paper feed. This assures crisp, legible, clear printing every time. Our paper rolls come in various sizes, giving you many choices. For thick rolls, you can use the paper for the cash register. Two-part terminal rolls are ideal for credit card machines. As long as you choose the appropriate roll size, it assures efficient workings. With the warning indicator stripe, you will always know when the rolls are about to need a replacement. Order your thermal printer paper rolls today from OfficeRock.com.